I don’t know about where you live, but Christmas is starting to seep around the edges everywhere here. In the last week, I’ve gotten two Christmas catalogs in the mail, letting me know that I need to get a jump on the decorating and gift buying and plans for cooking. 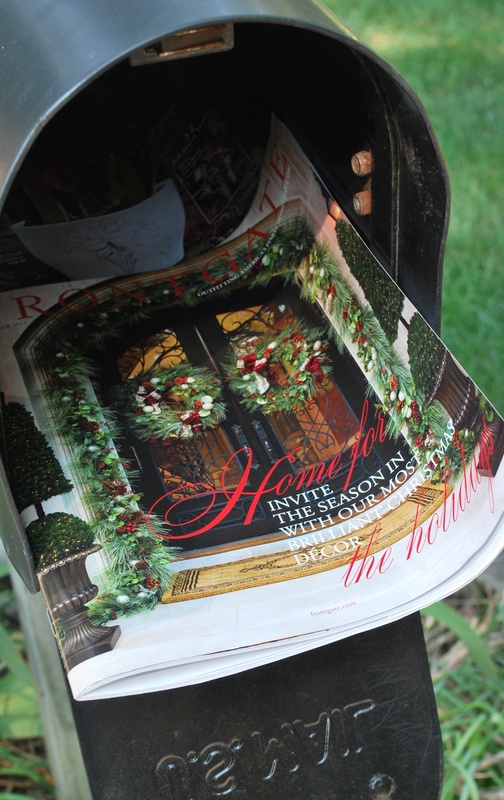 Have Christmas catalogs begun arriving in your mailbox? Today at Target, while I was hunting for mosquito repellant (still a dire need where I live), I wandered lost among the Halloween costume aisles hoping to find a last remnant of an outdoor section where the repellant sat all summer. And that’s when I stumbled upon an entire section of Christmas cards. In September. My husband and I haven’t figured out Thanksgiving plans, and already, marketers and merchants are subtly trying to convince me that I’m almost behind the curve on Christmas planning. All of this got me to thinking about what these retailers are attempting to accomplish, and I think it’s this: If they can make me worry that I may end up with a “less than” Christmas, one that’s less than my neighbors or friends or even the Christmas I imagine in my mind, I’ll buy a bunch of stuff now to make sure I at least look like I’m having a “more than” Christmas. I’m not sure when I first learned the less than symbol (<) in math (you know: 3<4), but I’m guessing it was at a pretty young age. You know what else I learned about “less than” at too young an age? What it meant to feel less than. I was less strong than the bully who punched me in the stomach when I was four. During PE in elementary school, I was less a runner than one of my smaller, faster friends, who completely dusted me in a race. It would take me 25 years to rediscover my love of running. Then in middle school, well, let’s just say they were three years of my life feeling “less than” in every single way possible. And then you grew up, and your SAT scores and GPA were less than. Your college major was less than. Then your career choice and on and on and on. Have you felt it? Retailers feed on that feeling from the time we’re old enough to talk and ask for what we see on TV commercials. And it never stops. I mean, doggone it, even if I don’t have a grand door to my house like the one pictured on the front of that catalog, I’m going to spend a lot of money decorating like I do have that door and that house and that lifestyle and that perfect family Christmas. At least, that’s what retailers hope I will do, and they hope everyone else around me will, too. Listen, I know it’s really too soon to think about Christmas. You may not even know what you’re having for dinner tonight, much less what your kids will dress up as for Halloween. But may I ask a favor of you? When those Christmas catalogs start pouring into your mailbox, will you stop and take a few moments to acknowledge the ways they make you feel less than. Or maybe it’s not even holiday catalogs that trigger those feelings. Maybe there are other areas of your life where you feel less than (like the good aunt who has no children, the last beautiful one of your friends still left waiting and hoping to meet that special someone, the hard worker who has no job, or the hurting person who has followed doctor’s orders and still not seen the healing come). God wants us to be humble, but He doesn’t want us caught in a trap of “less than” because we can’t flourish for Him when we’re stuck in that trap. So as you face down what makes you feel less than, just remember what’s coming. Think of whose coming we will celebrate at Christmas. For He is the “greater than,” and He loves each one of us, even on those days we feel less than worthy. Are there ways you feel less than? I’d be honored to lift up your struggle in prayer during this season. Just post it in the comments below (you can even sign in anonymously). Or email me your struggle, and know that I’ll be lifting it up to the One who is greater, the One who can triumph over all of our less thans. This entry was posted in flourishing tree and tagged <, Christmas, christmas catalogs, faith, good aunt, less than, lifestyle, prayer, retailers by hopesquires. Bookmark the permalink. II like your distinction between humility–the highest of virtues, according to Andrew Murry–and Satan’s impersonation of it–the sense that I’m “less than” acceptable. We might turn this on its head and let a feeling of “less than” be an occasion for gaining humility, which in its true form is simply an emptiness that makes room for God. I like that idea, Tracey — letting that feeling of “less than” be a trigger to invite God in to fill that space. Thanks for sharing it! It was a lesson learned years ago…I pray that those who are overwhelmed reach out to you and ask for your prayer to guide them through their struggles with the demands the media and the retailers place upon us. I must confess I have fallen prey to the marketers ploys for many a year. Usually I’ve been most vulnerable during the holidays when I was experiencing struggle or loss. This year, I think I’ll make a concious effort to look for natural beauty and celebrate that more than the artificial stuff. Thanks for the “heads up” Hope! We’ve gotten very simple too. Our son’s birthday is the day after Christmas. We make sure that he has birthday gifts in birthday paper and that Santa comes and he gets gifts from family and friends. But we no longer try to go to eveyr holiday event. It’s just too much and too frustrating and stimulating. We stick to the traditions and keep the meals simple. We try to celebrate the true meaning of the season and the joy of friends and family. And for neighbor gifts, we now give gifts to charities in their honor. I love this, Loy. I think so many of us are scaling back on how many events we try to attend. I love your idea of giving to charities in honor of your neighbors instead of trying to exchange gifts. For the last several Christmases, my neighbors have “adopted” a family to buy clothes, food and toys for. So much more meaningful — and simpler — than exchanging gifts with them all. When I was young, this scripture was on a poster on the wall of the Sunday School room. The poster was of a large green field with beautiful sun rays beaming from a brilliant blue sky. I always liked it and wondered, where was that wonderful field? I still think of this poster when having a “less than” moment because the passage is so uplifting. I love this verse, Jackie! I’m so glad that this post brought it to mind. And thank you for sharing such a sweet memory of your Sunday School room and the verse that lifted you up. Not totally on point, but last Christmas with a son returning from 6 months in Haiti and a daughter who really does so much better when holidays are not “over the top”, we celebrated Christmas in a much simpler way. It was my favorite one ever – think it may become a tradition. Those catalogs go right into the recycle bin at my house…. Tricia — you’re on to something. By celebrating what really mattered, you experienced a wonderful, meaningful Christmas with your family. My favorites have been the simplest ones, too. And your recycle bin strategy might just work for me too, especially if I go straight from the mailbox to the bin and the catalogs never make it inside!